Swene of Essex is believed to have been the uncle of King Harold and presumably the brother of Godwin, Earl of Kent. The same two names Swein and Godwin are present in Anglo-Saxon Swanbourne. Earl Harold (The King) had held a number of important places in Bucks. Aylesbury, Buckingham, Wendover, Risborough, Woburn, Edlesborough, Upton (Slough) and Swanbourne. These now became directly owned by William or one of his delegates. Being listed among the possessions of the late King suggests the probability of a one time great importance (Reading, 1994). Seventeen years after, in 1083, William was so firmly in control that he instigated an intensive survey of his new country to be carried out in order that the business of taxation should be properly implemented. This was completed in 1086. Most previously free holding farmers now had to rent their own land back from William or his Norman land thieves. This ‘Doomsday Book’ as it became known, shows our village community to have consisted of 25 households (regarded as quite large) at that time. The tax assessed was 19.5 Geld Units (regarded as very large). On the death of King Harold in 1066, the Witan (English Parliament) elected Edgar Atheling as King. He had been past over earlier in favour of Harold presumably because he was only a teenager. However, Edgar was persuaded to accept William of Normandy as king, his advisers becoming convinced that there was no alternative after the defeat of the English Army. As the Normans closed in on London, Edgar’s key supporters in the city began negotiating with William. In early December the remaining members of the Witan in London met and resolved to take the young uncrowned king out to meet William to submit to him at Berkhamsted, quietly setting aside Edgar’s election. Edgar is thought to have organised some rebellions, taking refuge in Scotland at the court of King Malcolm on several occasions. He also took part in the Crusades, outliving William substantially, there is evidence suggesting that he did not die until 1125. 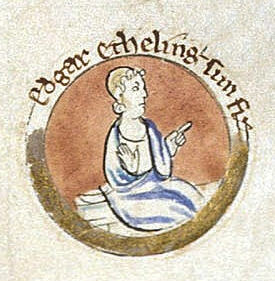 Edgar the Aetheling succeeded Harold after Hastings but was never crowned. Edgar had agreed to accept Harold. Swene is likely to also have accepted Harold at this time, consequently probably temporarily retaining his lands. The Domesday book shows the he was Lord in parts of Swanbourne & Mursley, the Claydons and Quarrendon in 1066. In summary, The Domesday Book tells us who owned the lands and what rental income came from them in 1066 compared with 1086 after the Conquest. The theft of land from the Anglo-Saxon nobility and landowners was organised by William himself, whereby a priority was to reward his Norman followers with the lands of a foreign country that he had conquered. Domesday explains how Swanbourne’s Anglo-Saxon Lords were confiscated, forced or purchased out. Swanbourne was unusual in having its land divided between 5 different landowners, with four manors. Of the other ten villages in the Mursley hundred, 5 were single manors (Dunton, Winslow, Horwood, Singleborough and Whaddon), 4 were double manors (Stewkley, Dratton Parslow, Salden, Shenley Brook End) and one had three manors (Mursley). The Earl of Moretain held land in Mursley and Salden as well as Swanbourne. Walter Giffard also held in Horwood, Singleborough and Whaddon (all single manors). Winslow was held by St. Alban’s Abbey, (along with Granborough and Aston in Cottesloe). Manor. Sueneborne was a village of Earl Harold’s. ploughs. In the whole it, pays annually thirty shillings of white money. In King Edward’s time thirty shillings by tale. Note:- Earl Harold had ownership or name association with 843 different places in England in 1066 and nil (as he had been killed, nominally all 843 places including Swanbourne lands were first confiscated by William). Of this manor Brixtuin a thane of King Edward’s held four hides and a half; and Almar, a vassal of Earl Harold’s one hide and a half and might sell them. Note:- Lord Brictwin a Royal Thane of Swanbourne owned a single place in 1066 and nil in 1086. Two thanes held this manor. Alward (five hides, saveone virgate) and Aluii (two hides and three virgates) had them for two manors, he might sell it. Note:- Alward the Noble was Overlord of 34 places England and 7 after the conquest (but this may not have been the same Alward). Pagan holds of William one virgate in Sueneberie. There is land to two oxen. It is and was always worth two shillings. Oswi, a vassal of Brictric’s, held this land and might sell it. NOTE:- Overlord Brictric owned 37 before 1066 and nil by 1086. Geoffrey himself holds two hides in Suenberne. There is land to two ploughs. One hide is in the demesne, and there is one plough there; and three villanes with two bordars have one plough. Meadow for two ploughs. It is and was always worth thirty shillings. Suen, a vassal of Asgar’s, master of horse, held this manor. He could not sell it without his leave. NOTE:- Lord Sweine of Swanbourne had Lordship of 3 places in England in 1066 and nil in 1086. 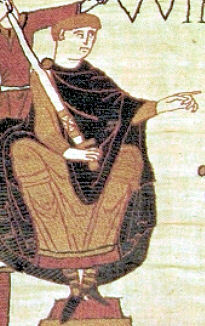 Asgar or Esgar the Noble, held ownership of 130 places in England before 1066 and 1 by 1086. In 1068 new Swanbourne Overlords such as William the Conqueror also owned 291 different places (having rewarded hundreds of confiscated manors to Normans during the previous 20 years); others such as Geoffrey De Mandeville owned 212 different places, and Walter Giffard was associated with 165.